This ski-in ski-out unit is one of the very best locations on Big Mountain and is in the heart of one of Montana’s finest ski resorts. Just 100 yards to the Home Again ski run that takes you to the base lodge where you can enjoy some world-class skiing. The resort is well known for a pleasant lack of lift lines and for its consistently good snow conditions, on average 300 inches a year! This 2 bedroom unit has large windows for ample light and spectacular views of the Mountain. Gourmet kitchen with stainless steel appliances, Granite Counters and Two Barstools for added seating. The living room has a gas fireplace, comfortable TV area with large flat screen HD TV and a kitchen table for four. Couch pulls out into a Queen-Size Bed to accommodate two additional guests. Master Bedroom has a queen-size bed, dresser for clothing and a mini-fridge to keep drinks and/or food in the room. The other bedroom also has a queen-size bed, Dresser and Large Closet for extra storage. All the bedrooms have luxurious linens. There is two full bathrooms in this unit with gorgeous tile showers. Enjoy having a washer and dryer right in the unit. Patio in back has table and chairs to enjoy the outside views and mountain air. One guaranteed underground heated parking spot (possible overflow parking). 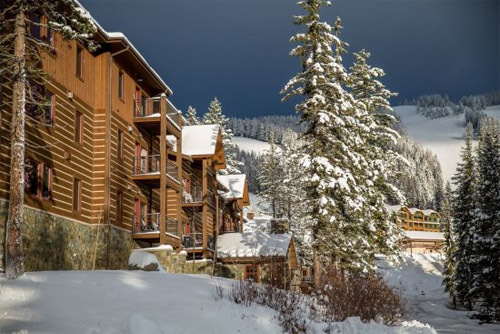 Your stay at this Whitefish Mountain Resort rental also includes ski lockers, large fireplace in the open lobby, rooftop lounge with kitchen, rooftop deck. You are in the center of Whitefish Mountain Resort village with only a 3-minute walk to Kandahar Lodge Restaurant with a gourmet menu and bar. Please feel free to call Erica if you have any questions!